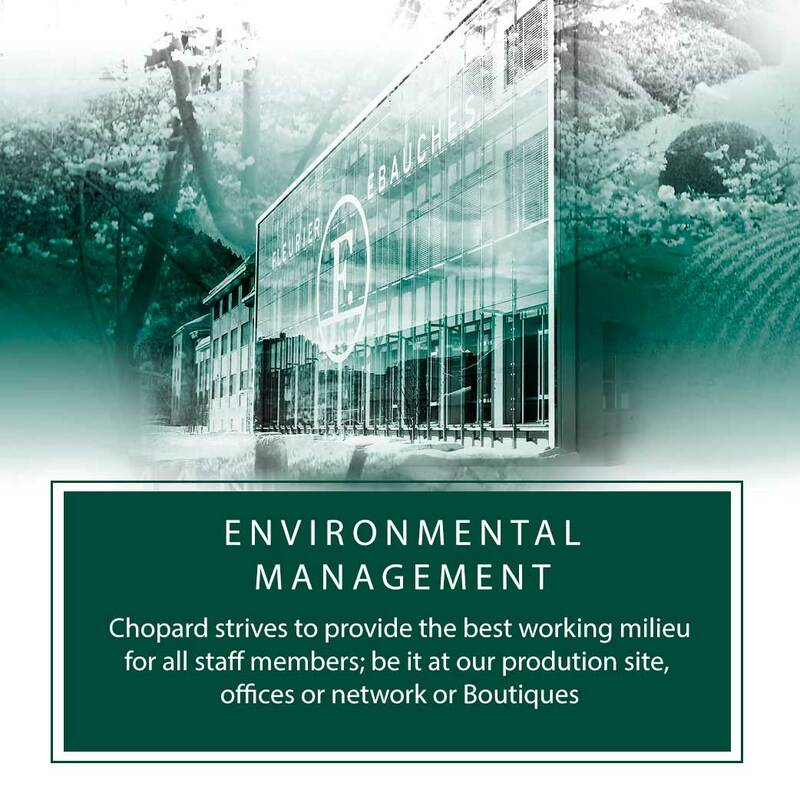 Chopard strives to provide the best working milieu for all staff members; be it at our production sites, offices or the network of Boutiques. Our innovative spirit drives continuous improvements at our installations, the use of advanced technical equipment and the enhancement of working conditions. Not only do our facilities meet all legislative requirements, but we also go beyond these and provide efficient, low environmental impact buildings, which demonstrate our commitment to sustainable growth. Thus, in 2010 the Geneva head office inaugurated the first building constructed with consideration of Minergie, a rigorous Swiss eco-friendly construction standard. This building is a champion of low-resource consumption and energy efficiency. The double isolation envelope allows cooled air from the restaurant to be re-used in the air conditioning systems and rainwater collectors give full autonomy for garden irrigation. 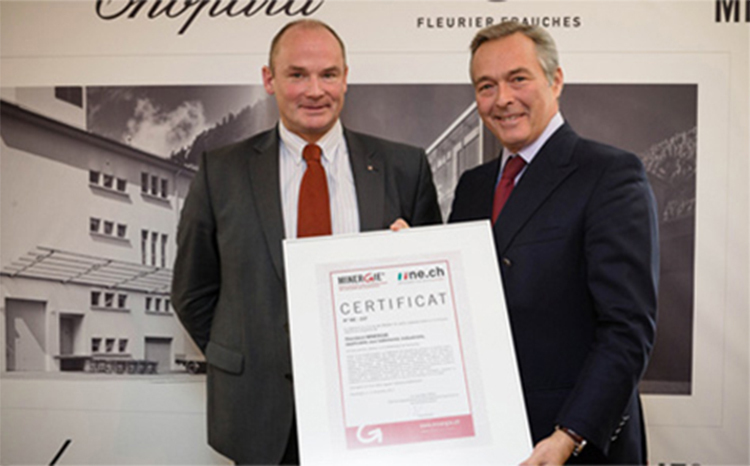 In December 2013, after five years of renovations the Fleurier Ebauches building was awarded the Minergie label. 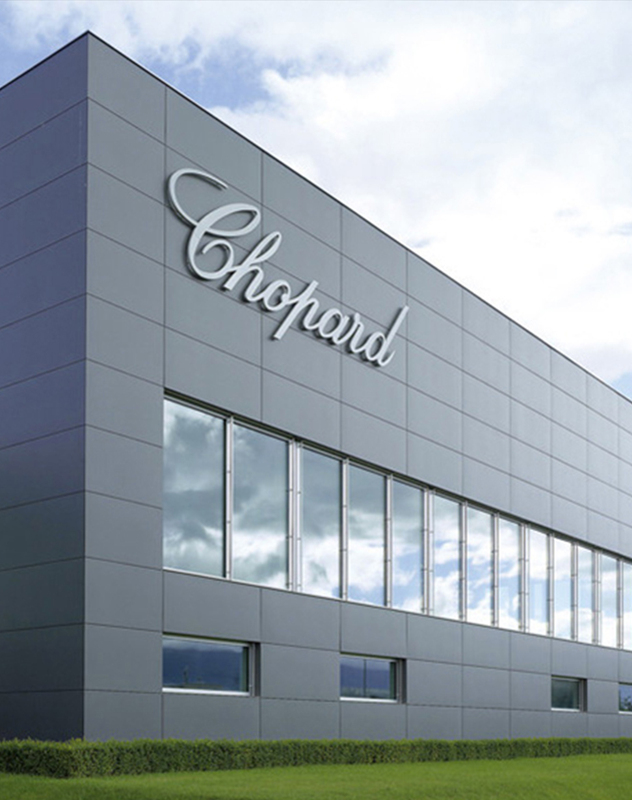 This state-of-the-art industrial facility producing movements for Chopard watches is the largest building to be refurbished under the Minergie norm in the Canton of Neuchâtel. To minimise energy consumption the ground floor was insulated to a width of 120cm, whilst a second skin was added to the façade of the wing to ensure ventilation in summer and heat recovery in winter. All electrical installations were selected according to Minergie standards and the roof was covered with solar panels. We monitor waste production and greenhouse gas emissions generated by our operations, in order to continually improve our environmental impact over time. We strive to minimize emissions associated with business travel by favoring video-conferencing wherever possible and encouraging sustainable mobility and car sharing among our staff members. Specific measurement systems are in place to monitor our VOC emissions, as well as water and electricity consumptions. Finally, guided by the REDUCE – REUSE – RECYCLE motto, we have established a thorough range of recycling lines allowing for nearly 30 different materials to be collected and reused. All Chopard printed marketing and communication material, as well as shopping bags and wrappings, are made of FSC certified paper. The legendary Chopard shopping bag is fully plastic free. We only use recycled paper for our office needs and promote paper-less meetings. Moreover, all printers are set for double-sided printing by default. Chopard constantly works to improve the packaging material used for our masterpieces. The number of ecologically balanced watch & jewellery cases with components conforming with highest environmentally friendly criteria is growing every year. In this field, we favour materials certified by the Forestry Stewardship Council (FSC), Oeko-Tex and the Programme for Endorsement of Forest Certification (PEFC).